One of the most interesting uses of twitter I’ve been a part of is the Twitter Taste Live wine events. The last TTL event was the first I participated in. It was a Steele Wine tasting, where several of us ordered 6 different Steele Wines varietals from Bin Ends Wine, and tasted them “together”, using twitter to communicate our tasting notes. Some of us tasted the wines with friends having wine tasting parties and tweeted their notes, where as I used Ustream to do my tastings via video and tweeted my notes. There were about 26 people in the ustream chat, and hundreds if not thousands participating via twitter. The event lasted several hours, and it was a lot of fun. The next twittertastelive.com event is Saturday November 15th at 6pm est. The premise for this event is “Bloggers Take Over”, where several wine bloggers have selected wines they wish to taste and review via twitter. This event is packed with different wines, including Sake, a Chinese wine, a selection of Hahn wines, and my selection, Grocery Store Zinfandels. A complete listing of the wines is on the twittertastelive.com site, and I’ll recap my selections below as well. If you are not yet a member of the TTL social networking site, I recommend you sign up. It’s free, and will enable you to participate in the forums as well as be notified about the events. When you create your profile, please put “mmwine” as your referral, as there’s a blogger contest to sign up the most people. Hopefully you can find the wines, and taste along with us. Some questions have come up about the tastings, so I’ll do my best to answer them here. The event starts at 6pm EST, and I am not sure of the format. I am thinking we’ll likely alternate bloggers, so one blogger doesnt wait for all the others to finish to get their chance. 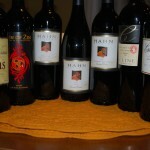 I know that several people are getting together in California and tasting six Hahn Estate wines. I have gotten some of those wines as well, so I can taste them along with my California Compadres! Some people will taste the wines and, in the most demure fashion possible, spit. Others will taste and drink their wines. Some people will get all of the wines, because they’re crazy like that. Others will get a smattering of the wines, trying to taste along with as many people as possible. In the end, it’s whatever works for you. Grab a bottle and join us, alone or with friends, and lets see what we think of these wines together. I will be doing my tasting on my ustream video channel. No one else needs to be on video, unless they want to stream their own tastings. When people tweet their tasting notes, they’ll add #TTL as a “search tag” so that you can hit summize.com and see what they’ve said. Craig also has the last few #TTL tweets on the twittertastelive.com home page. I’ll probably have some cheeses or other appetizers to pair with the wines, in the hopes of offering you some food and wine pairings that are note worthy. The event will probably go two or more hours, and be an all out blast! Have any questions? Send me an email at matt.mmwine (at) gmail.com and I hope you can join us on Saturday November 15th at 6pm est.